Richard Gage, AIA, is the founder of AE911Truth. Editor’s Note: I am leaving the following link to Richard Gage’s northwest tour even though it’s done and over, because it’s good to see examples of the work Richard has been doing through the years. Pacific Northwest AE911Truth Premiere Tour! Thirteen Cities in Oregon, Washington, Idaho, Montana! 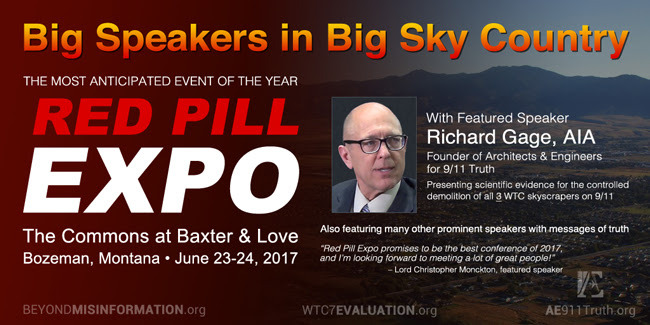 Come Meet Richard Gage At The Red Pill Expo! Editing this video into this page on April 11 2017. Here we have one of my favorite TMMers, Richard Gage of Architects And Engineers For 9/11 Truth, appearing with James Corbett and joined also by famous NSA whistleblower William Binney. This one is red hot! Enjoy…. In August of 2014 the C-SPAN interview with Richard Gage rocketed to C-SPAN’s all-time Top Ten most-viewed videos.